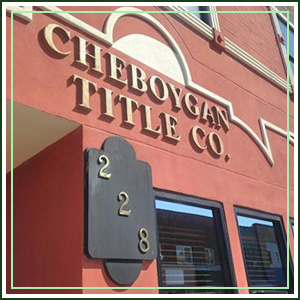 For more than 35 years, Cheboygan Title Agency Inc. has been providing title insurance and escrow services to Northern Michigan real estate agents, lenders, attorneys, corporations, and homeowners. With offices located in Cheboygan and Rogers City, MI, our title insurance and escrow service experts take pride in coordinating residential and commercial real estate transactions with the highest degree of efficiency and customer service. We establish and maintain an underwriting representation with the largest and highest-rated title insurer in the industry. At Cheboygan Title Agency Inc., we believe in fairness and integrity in our relationships with customers, employees, regulators, and vendors. We are a family owned, regionally focused title insurance organization in which employees actively participate in our operations and successes. By building a strong relationship with clients and partner companies, our agency continues to strive toward meeting the opportunities and challenges of the next century. Have peace of mind knowing that all your title insurance needs are properly taken care of. Turn to our team and be assured that you are in good hands. If you have questions, get in touch with our title insurance experts using the phone numbers or email addresses listed on this website. For orders and general questions, click here. For closer’s questions and escrow, click here.